I am close to coming to the end of my Enormous Kitchen Project (sadly, the kitchen is not enormous – I use this adjective to capture the fact that getting the kitchen to be as desired has impacted every room on the lower floor as well redoing a patio). As a result, I had a brush with the building trade, and it made realise how useful big established brands are for when you wish to scrutinise purchase decisions. I happen to be rather sensitised to the concept of corporate responsibility as I have spent the past couple of months reading annual reports across a variety of different sectors – it means I know that a good company should be able to trace its supply chain and support initiatives such as EITI, RSPO, FSC , and others as appropriate. Imagine my consternation, therefore, when I found myself having to buy stuff which didn’t have a brand and offered little product information to reassure my guilt at creating so much waste (several skips loads), and using up such precious natural resources. The paving slabs used to create the patio are natural sandstone from India, but as they were bought from a builders’ merchant, there was no nice glossy packaging – just pallets wrapped in tough plastic. How can be I sure that villages and forests weren’t ripped down to get that stone? And likewise for the granite – from Kashmir – which doesn’t sound promising for a start. The only time I saw some ‘credentials’ was on the plywood used to lay a new floor – this was reassuringly marked with ‘FSC’ initials. What I did try to do was ask questions of the people I was buying from to raise consciousness of these issues – perhaps they might realise that their customers want to know about these things. However, if I did get answers, I can’t say that I was always reassured by them. One builder told me the contents of the skip would be sorted to see what could be recycled. 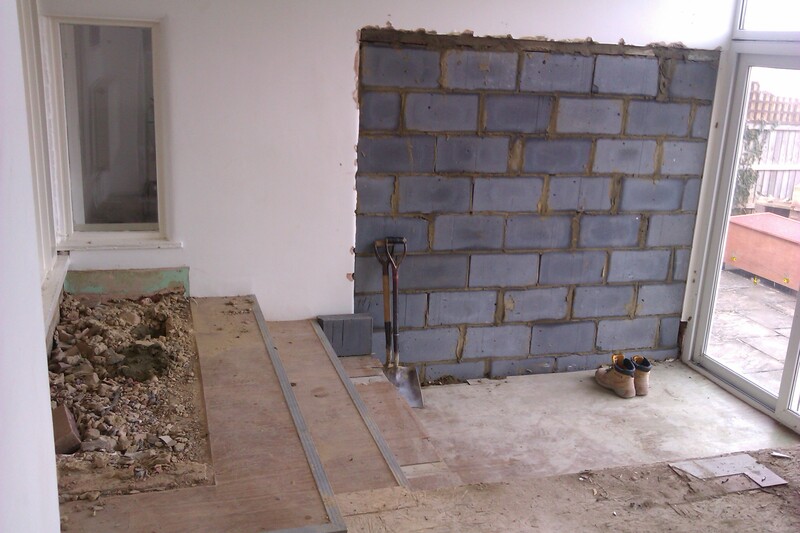 When I mentioned this to another builder, they left me feeling less than convinced. This was the trouble – I had to take people at their word with little means to check up on them. Still, I am at the decorating stage and at least I have been able to choose the paint – B&Q own label will do the job. It ticks the ‘eco’ box and ‘good value’ box – at the end of an Enormous Kitchen project, luxury is a thing of the past. Fingers crossed this kitchen here’s for good!